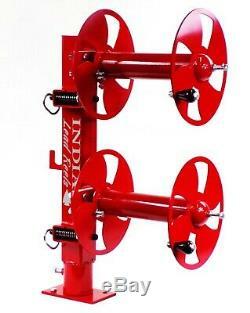 This listing is for a double stacked lead reel (Swivel Base RED 10). Stays connected to the welder at all times (Live Reel Setup). Swivel feature allows for 360 degree rotation of spools. Locking latch pins secure spools while not in use. Ported spool designs aide in cooling of leads. Tension brake adjusts tension on spool to prevent backlashing. 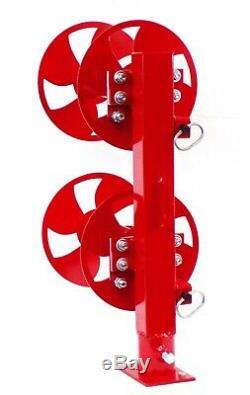 Can be bolted or welded to any flat surface with ample support. Full line of replacement parts. All of our reels are built with HEAVY DUTY steel bushings (No Ball Bearings). Will last much longer than any standard ball bearing spools. Harware is all ZINC plated for durable finish and longevity. Does not include cables/leads or cable lugs. 10 - 150' Capacity of 1/0 cable or 125' of 2/0 per spool. 12 - 200' Capacity of 1/0 cable or 175' of 2/0 per spool. Overall Height - 27.5. Overall Width - 18.5. Weight - 38.5 pounds. 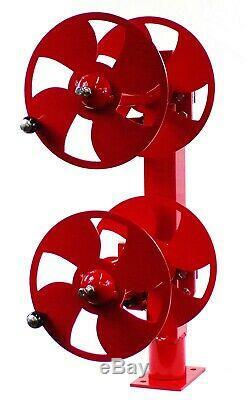 The item "10 WELDING LEAD REEL CABLE REEL SWIVEL BASE HEAVY DUTY RED" is in sale since Wednesday, February 6, 2019. This item is in the category "Business & Industrial\CNC, Metalworking & Manufacturing\Welding & Soldering Equipment\Welding\Other Welding Equipment". 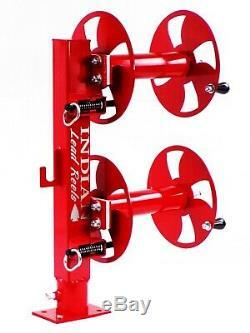 The seller is "indianleadreels1" and is located in Ringling, Oklahoma.